At least 15 people have died in clashes between police and Islamic hardliners demanding that Bangladesh implement an anti-blasphemy law, police say. 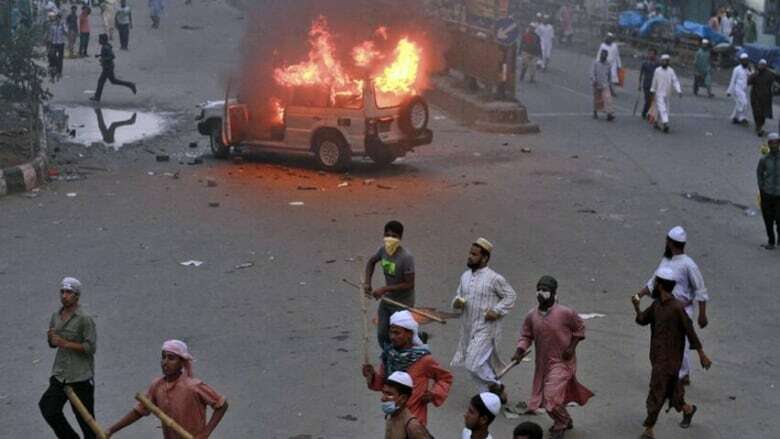 A police official, speaking on customary condition of anonymity, said eight people, including two policemen and a paramilitary soldier, were killed in clashes in Kanchpur just outside the capital, Dhaka. Another seven people died in Motijheel, a commercial area of Dhaka, the official said. The protesters blocked roads in the area with burning tires and logs during more than five hours of clashes, television footage showed. The private United News of Bangladesh reported that the violence erupted after security forces fired tear gas and rubber bullets in the central commercial district. The Islamic activists have been protesting to demand that the government enact an anti-blasphemy law. The government in the Muslim-majority nation has rejected the groups' demands, saying Bangladesh is governed by secular liberal laws. Dhaka Metropolitan Police said in a statement that all rallies and protests have been banned in the city until midnight Monday for fear of more clashes. Prime Minister Sheikh Hasina's ruling Awami League and an alliance of 18 opposition parties led by former prime minister Khaleda Zia had planned rallies in Dhaka later Monday. There was no immediate comment from the parties.